The Good Samaritan Law encourages minors to call 911 when they suspect an alcohol overdose without fear of receiving an MIP (minor in possession). A revised version of the law, protecting both the intoxicated minor and the caller went into effect . 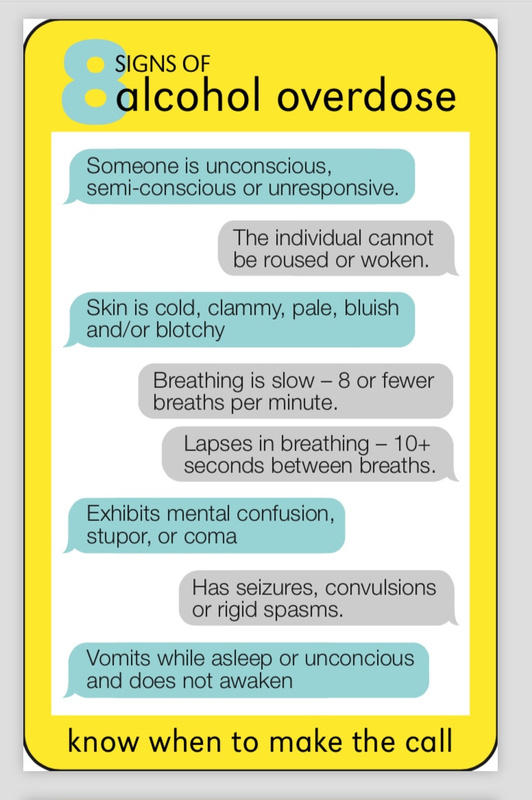 What are the signs of an alcohol overdose? A person may exhibit one or many of the signs. No matter the number, when in doubt MAKE THE CALL to 911. Someone is unconscious, semi-conscious or unresponsive. The individual cannot be roused or woken. Breathing is slow – 8 or fewer breaths per minute. Lapses in breathing – more than 10 seconds between breaths. Exhibits mental confusion, stupor, or coma. Has seizures, convulsions or rigid spasms. Vomits while asleep or unconscious and does not awaken. Q: What will happen if I make the call? A: When you call 911, the operator will ask you for the purpose of your call. Report your concern about the individual, their signs, symptoms, and your current location. Be prepared to share specific information like what they drank, how much they drank and if other drugs are involved. Remember, the most important thing is to get your friend (or yourself) medical attention. First responders (EMS, Fire, and Police) will be sent to the person(s) requiring medical attention. Q: Do I need to stay on the phone? A: Yes, you need to stay on the phone to provide necessary information to the 911 operator including any additional details. Afterward, you will need to stay with the individual and cooperate with the first responders. A: You do not need to say anything specifically to use the Good Samaritan Law. You should tell the 911 operator why you are calling and respond to all questions. You must remain on the scene and cooperate with the first responders. Q: Will I get in trouble with the police or the university? A: The Good Samaritan Law provides limited legal immunity for both the first person who calls and the intoxicated minor. You will not be cited for MIP (minor in possession) if you remain on the scene and cooperate with the first responders. If the university becomes aware of the incident, the intoxicated individual may be asked to meet with a counselor to assess their well-being or participate alcohol education meetings. Remember, there may be violations beyond MIP, which are not protected by the law. Q: Does the law cover DUI if you’re trying to help get someone to medical help? A: No, drunk individuals should never drive. If you are with someone who needs help, call 911, do not attempt to transport the individual yourself or allow others to do the same. Q: If I call, what type of reporting info is kept about me? A: The University will retain a limited amount of data for assessment purposes including identifying potential patterns and trends. 911 activity calls are maintained for a minimum of one (1) year. Q: Will the person’s parents find out? A: Consistent with provisions under the Family Educational Rights and Privacy Act of 1974, the university may notify parents when there is a health or safety emergency involving their son or daughter, even if the parents do not claim the student as a dependent. Q: What happens if it happens again? A: The University evaluates each incident and the application of the Good Samaritan provision on a case-by-case basis. If repeated incidents indicate that students use the law to avoid the consequences associated with high risk, illegal or unauthorized drinking, a student may be sanctioned to participate in disciplinary proceedings. The Good Samaritan Law provides legal immunity only for MIPs. It does not cover immunity for assaults, procuring for minors, disorderly house, trespassing, using a fake ID, hazing, etc.